Launched in August 2011, brand new super-slick Tusa 6 is Tusa's latest custom built reef craft. The 24 metre Tusa 6 is designed with ultimate comfort in mind for a day cruising, diving and snorkelling. Tusa 6 travels at around 20 knots, which makes for more reef time and less travel time. Travel time is approx 90 minutes depending on location giving you 4-5 hours on the reef. With staff to passenger ratios as high as 1:5, this trip can accommodate all levels of experience and allow the staff to provide that little extra in service. Tusa 6 visits 2 Outer reef sites selected from a range of over 16 sites. The sites visited are unique, and the captain selects a different reef each day depending on conditions. Tusa has dive and snorkel locations on the outer reefs off Cairns including Saxon, Hastings, Flynn, Milln, Moore, Thetford Reefs, and Michaelmas Reef. 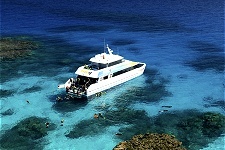 Certified divers have the option of doing up to 3 dives, while snorkellers are given unlimited snorkelling. 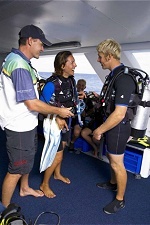 This trip can also cater for people who have never dived before, but wish to try it with Introductory Diving.